Given James Elliot Cabot’s affiliations with the Boston Athenæum, it is appropriate that this bust would eventually come to the institution’s collection. Cabot (1821–1903) was a descendant—on both his paternal and maternal sides—of Thomas Handasyd Perkins, one of the most significant early benefactors of the Athenæum. From 1857 to 1902, Cabot was a trustee of the Athenæum, for which his brother, Edward Clarke Cabot, designed the institution’s Beacon Street building. James Cabot was an art critic and a founding trustee of Boston’s Museum of Fine Arts. His family and institutional connections brought him in close contact with some of the great cultural figures of his day, including Ralph Waldo Emerson who was one of his closest friends and for whom he would be literary executor. 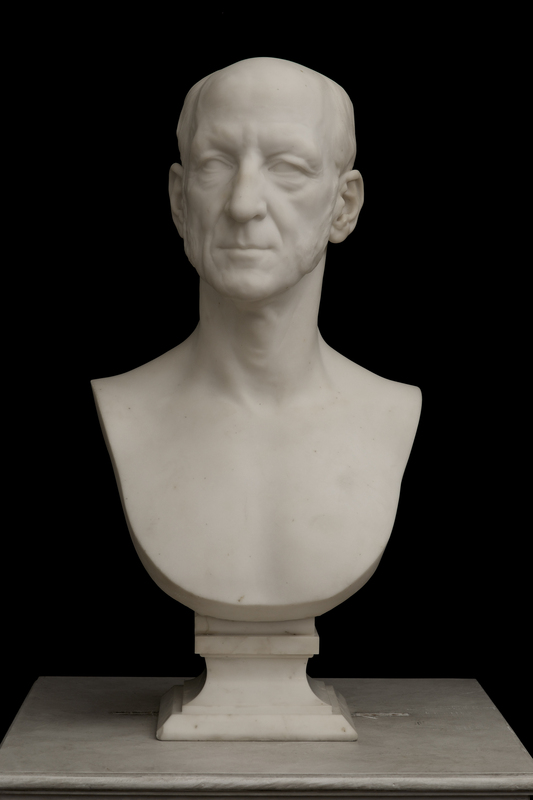 In fact, Emerson, who had been the subject of one of sculptor Daniel Chester French’s earliest successes, was instrumental in bringing the two men, Cabot and French, together for the creation of this bust. Inscribed on right shoulder: "D. C. FRENCH / 1880"